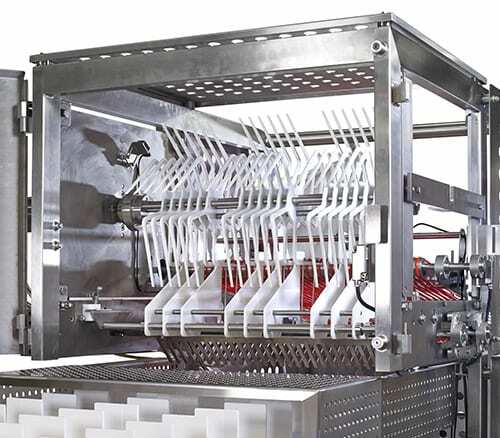 From supporting multiple lane production lines to handling delicate products, Pacproinc®‘s stacking equipment is as flexible and configurable as your business needs. From pizza crusts to hamburger patties, and fresh deli meats to lay flat bacon, our worry-free stacking solutions offer proven automation and placement consistency for your food packaging process. Pacproinc® stacking equipment brings consistent and quantifiable improvement to your production line through faster stacking solutions and improvements. The ProStax USS is the most flexible stacker in the ProStax line-up. While many stackers are focused on long or short portions to achieve maximum speeds, the Universal Shuttle Stacker is built to handle both long and short portions with no changeover. In keeping with it’s “universal” name the USS is also great for applications that need to run without paper or “bypass” the ProLeaver. By simply turning the ProLeaver and the ProStax into bypass mode, products can be sent over the system without moving line components or adding auxiliary conveyors. Many other ProStax models require paper under portions to perform optimally. ProStax USS can stack products with or without paper. ProStax CBS4 is the world’s only counting and stacking automation solution for pre-cooked bacon. 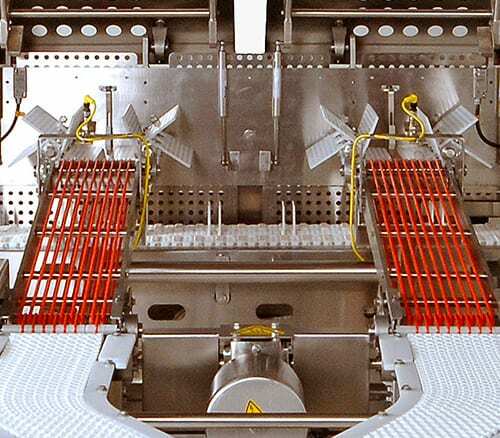 Built specifically to automate the traditionally manual process of counting and stacking sheets of cooked bacon, the system overcomes the challenges related to conveying and stacking bacon of different cook levels. As an example, the stacker handles thin dry bacon just as well as greasy thick bacon. This is truly a breakthrough. 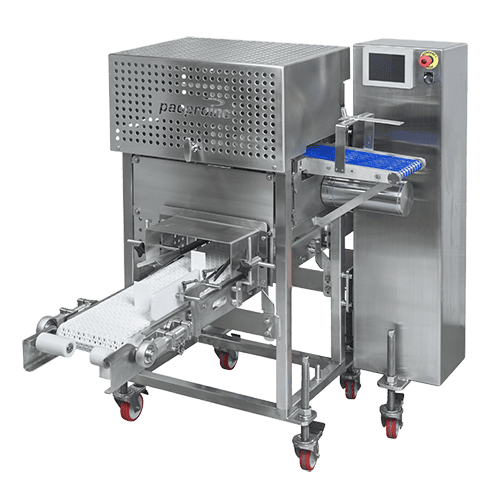 In addition to reducing labor and repetitive motion injuries, the system combines the finished stacks into a single lane of flow for easy conveying to a packaging machine. The ProStax CBS can be optioned in a 2, 3 or 4 lane configuration to suit virtually any cook line. The system consists of a “module on frame” design meaning the stacker can be configured with either 2, 3 or 4 stacking modules attached to a common frame. These stacking modules can be easily removed and maintained or repaired off-line in the maintenance shop. 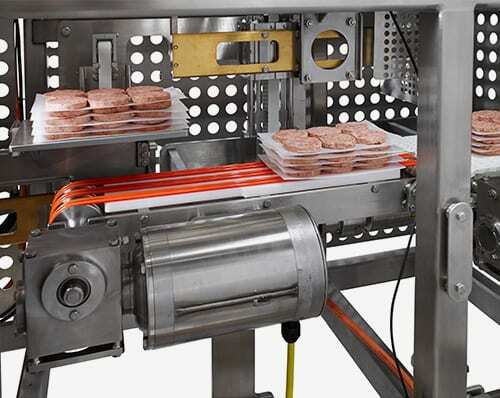 The ProStax HPS is specifically designed to count and stack fresh, formed, homestyle hamburger patties that have been interleaved on one of our ProLeaver systems. What really sets the ProStax HPS apart is its ability to drop stacks of burgers directly into trays. Further, at speeds up to 230 patties per minute this stacker outpaces any competing solutions. The ProStax FW represents one of Pacproinc®’s original innovations. It is offered in widths from 9” all the way up to 32” and can handle 1 to 7 lanes of products. It’s specifically developed to run portions shorter than 6.5” at speeds up to 280 cycles per minute. 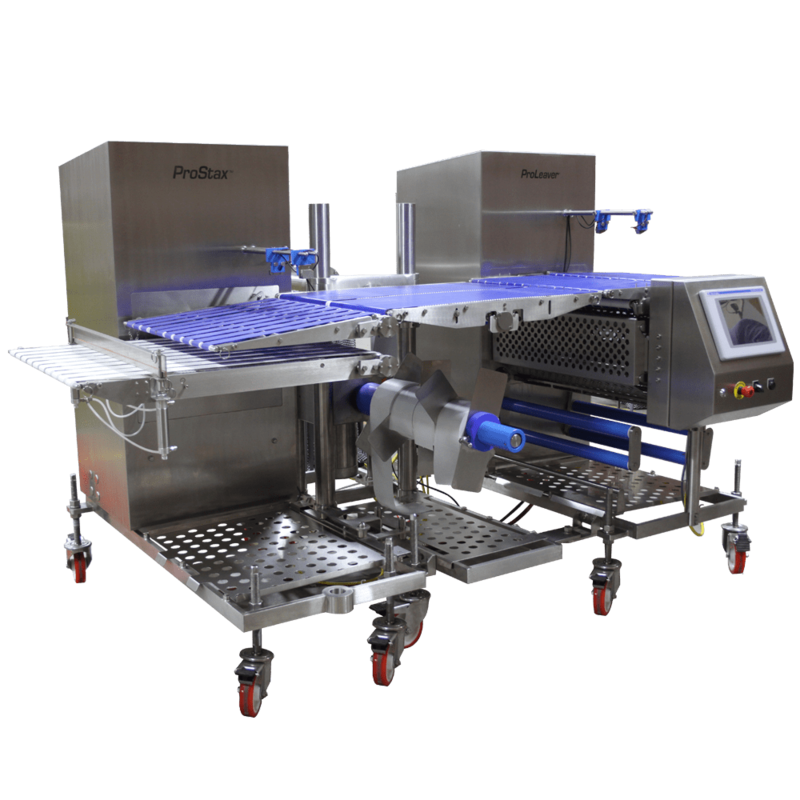 When interfaced with one of our ProLeavers, the ProStax FW completes your automation solution by reducing labor and repetitive motion injuries while increasing throughput, uptime, and food safety. 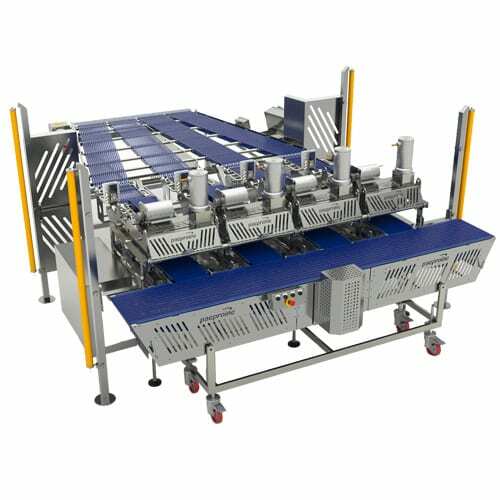 The ProStax FW can be equipped with a 90 degree stack discharge conveyor to singulate finished stacks for easy feeding of flow wrapper or packaging machine. Or you can add an optional bypass for when you want to run product that doesn’t need to be interleaved or stacked. The ProStax SW is a high-speed counter and stacker specifically designed for long portions. It can be optioned in a number of variations for single lane, dual lane, or even dual heads in the case of high-speed applications like lay flat bacon. Like the entire ProStax product line the SW offers reliable, low cost, worry-free automation in a proven design. Whether it’s long sub/deli portions, pizza crusts, or bulk and lay flat bacon the ProStax SW is the right solution. The ProStax PS is specifically designed to handle delicate or frozen portions that cannot tolerate a significant drop. By limiting the drop distance to just the thickness of the portion the ProStax PS is ideal for LayerPack applications like sliced sausage or cookie dough. In some applications like cookie dough, the PS system can even be used to automatically load cases. Available in narrow and wide widths and cycle rates up to 70 per minute. Pacproinc® offers versatile automated stacking solutions to support your growing business.